Schools are struggling to figure out the best way to communicate emergency information when it comes to school safety. 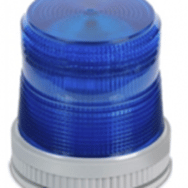 Many schools are installing strobes in their emergency notification systems. Some schools have multiple strobes and train students and staff. They run drills for the appropriate response to each strobe’s event. Amber strobes can indicate a severe weather alert situation. Blue strobes can indicate a lock down situation. These visual messages are accompanied with an audio page. The strobes are also ideal for high noise areas. The strobes can heighten the urgency of the emergency, when an audio page might not be enough. Systems can be installed with buttons for designated staff to trigger the strobes. This gives a visual indication that students, staff and visitors should go to Areas of Refuge or exit campus. We all hope that schools never need to use these emergency measures but it is vital that schools become proactive regarding school safety. Visual communication in addition to audio communication is critical.